Let's start with the obvious: find a home that is tailored to your needs and to your budget. But often this is an impossible task, especially today! It is impossible to find space for all that we have accumulated over time, in a tiny house, which barely has enough room for two plus the dog. Budget ends up being the main factor, leaving us in a space that no mortal humans can possibly fit into. We need simple and effective solutions that allow us to take advantage of every square centimetre of our home, making use of every little space that is empty, unoccupied or neglected. Today's article will allow us to unlock some of these spaces so that they are used in the best way possible. We are gong to gain space in our home without having to do a single stitch of building or construction! We will expand the surface area of your home so that you will forget just how small it is or that you ever felt cramped or crowded in it. There's no need to change your address to get more space! A basement, just like the attic, can be quickly transformed if you do a proper spring clean. Go through everything and be ruthless! That painting you vowed you'd never use but kept just in case must go. That hideous statue your aunt gave you in the fourth grade must go. That Christmas present from 10 years ago that you've kept but never use must go. More than half of the things that are stored in your basement are lost or unnecessary items that will never be used. It's time to get rid of them. Take a weekend to sort through everything. Once you've one a proper clean out, you'll have a whole basement space open for parties! Won't this be so much fun? By cleaning out your basement, you're not only making space for a room that is more functional, but you can also put to rest old memories and junk that is no longer relevant in your life. You've lived this long without thinking about them or needing them, it's time to throw them out! A garage space is not only fun for kids—there are many adults who cannot resist a good game of virtual football! The idea is to create a space in your garage where toys, musical instruments and hobbies all live together in harmony, keeping the space inside of your home free from clutter. No more toys on the kitchen floor, in the bedroom or on the tables! 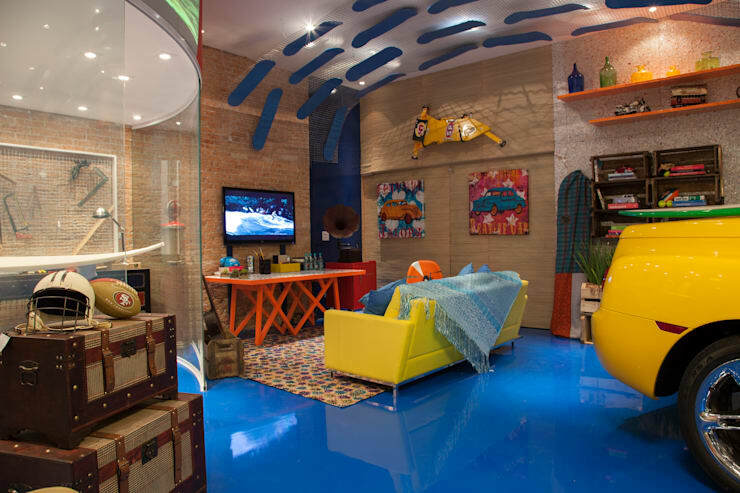 You can also have some fun decorating the garage in a relaxed in cheerful way with strong, bold colours and bookshelves, tables and comfortable chairs for everyone. This will be the space for your kids to meet their friends, do their homework and even watch a movie or a good game of football if you are able to set up a television in this space. Here you don't have to worry about hiding toys or the mess that the children will make—it's part of the charm. This space is all about controlled chaos. Let the board games, DVDs, vinyl records or materials for DIY craft projects litter the area so that everyone can have fun at any time! But if you do prefer a more tidy room, you can choose to store toys and items in drawers and on shelves. Simply label them so that they can be found easily. 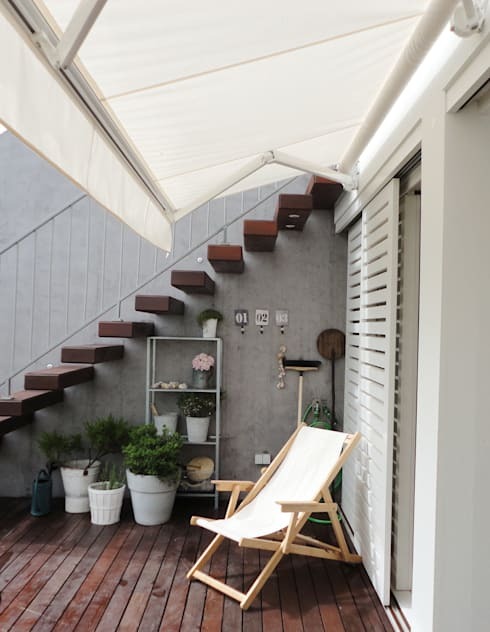 You don't have to have a terrace or a garden to hang out with your friends outside, where you can cool off on those hot afternoons or curl up in a blanket on sunny winter days. 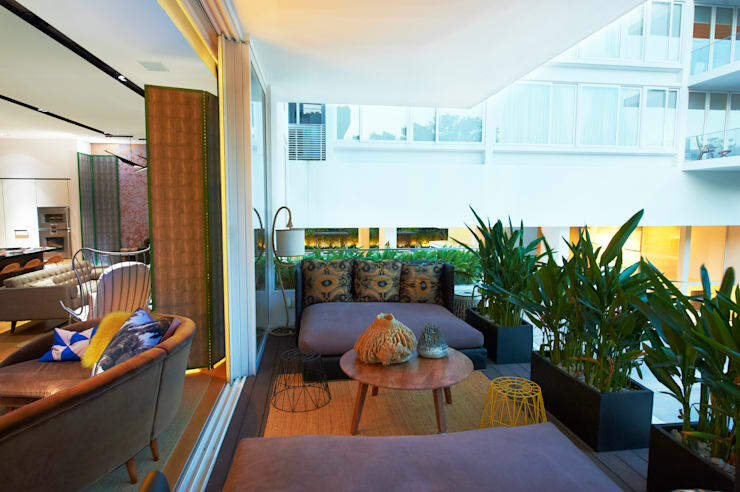 All you need is to convert your balcony into an outside living room! Start by creating some privacy, without taking up too much of the outdoor space. Medium-sized plants that are slightly taller than the balcony railing are a great option for this. Then choose sturdy furniture that is able to withstand the outside elements while still remaining comfortable and durable. The rest of the decor is up to you! 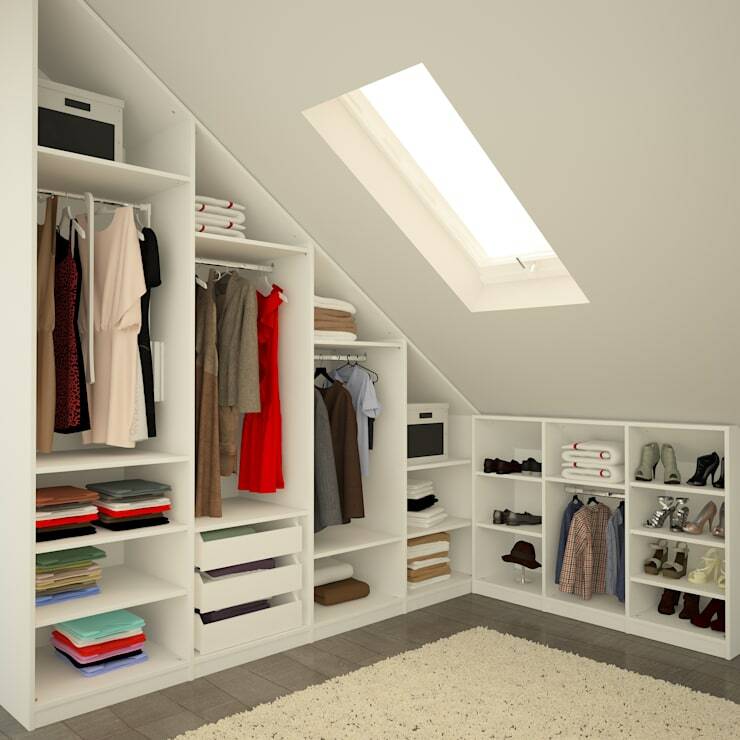 Although using attics for storage is not a new concept, there are still many houses that don't utilise this space effectively whether from lack of imagination or lack of will. If you have a problem with a crowded attic or a lack of space, this is a tip that is just for you! Because of its design, this is a space that requires a little bit more imagination, but there are two easy options: either create a room where you create storage based on the ceiling height, dividing up each space or you can create storage across the entire length of the attic, as seen in the photograph, depicting this neat attic space by Meine Mobelmanufaktur. In the lower sections, you can make room for small items and accessories and in the higher spaces, you can store items that you don't use daily on the upper shelves. Put your winter clothes up here in summer and swap them with your summer clothes in winter. The space under the stairs can be a real headache for anyone. That's why it's so important to give it some attention and see what you can create out of this under-used space. Depending on the location of the stairs, you can create a small office, a small bathroom for guests, a closet, a shelf or even a little bedroom… the choice is yours! Think carefully about what would be most beneficial to put under the stairs and you will improve the space situation in your house immediately! Finding an excellent use for this space can give you more storage space or can even just help you to decorate your home more beautifully. For more inspiration, don't miss these great: Inventive Ways To Use That Wasted Space Under Your Stairs. Have you ever looked around your home and felt that there is so much space, but it's just impossible to occupy? Well we have the solution! Sometimes when you are standing, the vertical space at eye-level or even higher can seem wasted and empty. 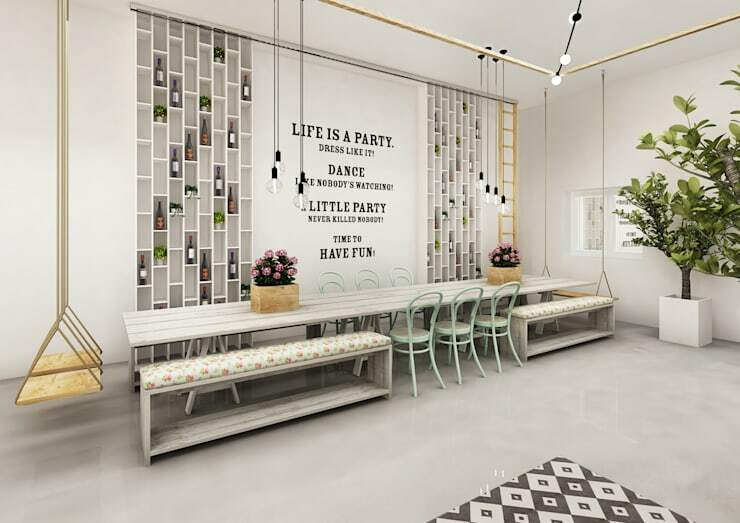 So why not create shelves or cupboards that use up the vertical space right up to the ceiling? You can utilise this space in a small room for two children, creating a bunk bed and wardrobe in the vertical space. This photograph shows how much more space there is in the room when the vertical space is utilised, creating space for a desk in the room. Your children will also have more room to play! Which of our ideas most sparked your curiosity? Will you try any of these projects at home? Let us know!